A multi-stage multi-discipline project, designed to provide an emergency replacement in PVC for a damaged section of a PTFE structure. Stage two was the redesign and installation of an upgraded PTFE roof. 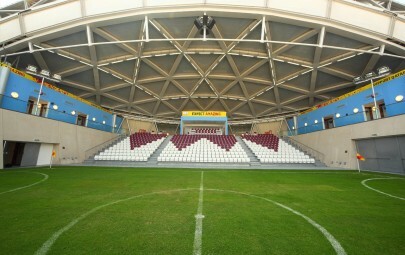 Stage three was the design and installation of acoustic improvements. Stage four, continuing monitoring and technical assistance. 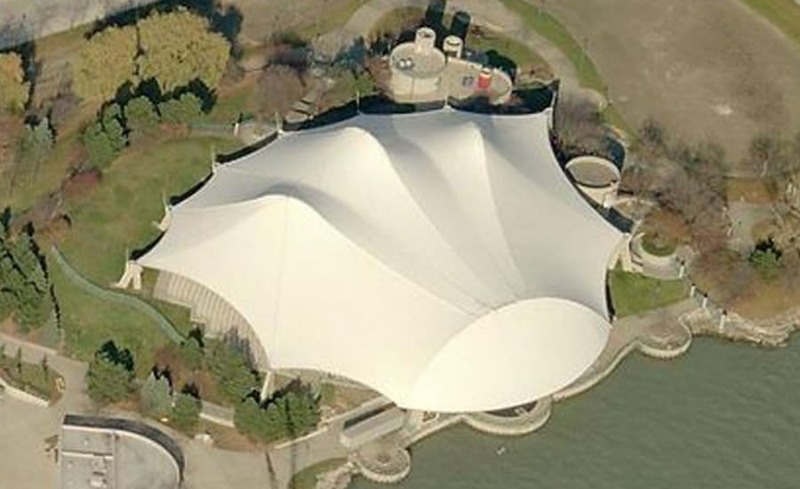 Chene Park amphitheatre is a central feature in the regeneration of the once industrial urban river frontage, completed before the turn of the millennium by an American contractor. The ridge and valley PTFE structure struggled to cope with the unique environment in which it was located. Architen Landrell were commissioned to work with the Engineers in New York to initially provide a replacement panel in PVC to enable the structure to be used for the 2002 summer season. During this time the two central panels of the structure were radically re-engineered. New panels, cables and associated membrane plates were manufactured prior to the end of the snowfalls in the spring of 2003. With a window of less than eight weeks between the anticipated last snowfall and the first scheduled event a highly co-ordinated program of work had to be carried ut some 4000 miles away from the company base. The existing two panels were removed and the new additional valley cables were deployed. 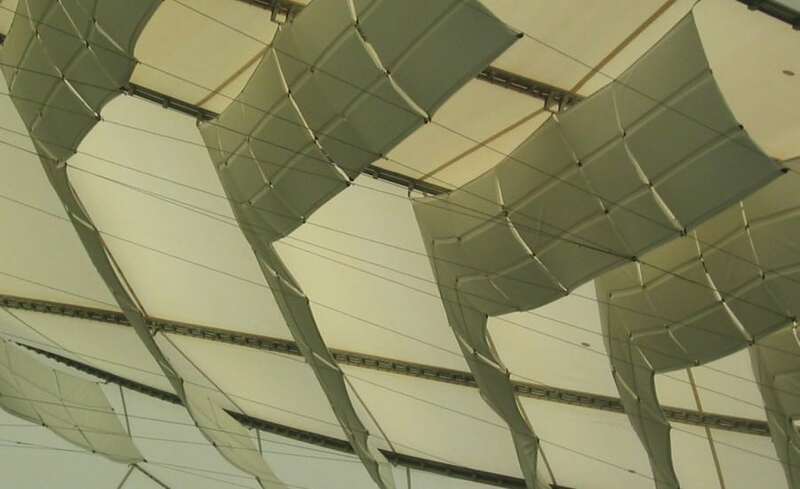 The PTFE fabric panels were then tensioned into place using alloy c-clips around the boundary. 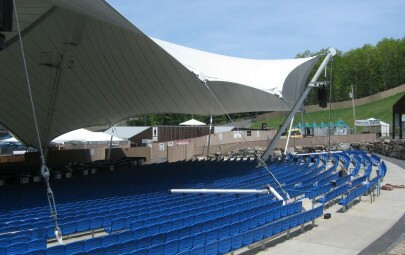 To aid the shedding of snow during the winter months a unique gutter up-stand was developed that is automatically inflated when it rains but deflates and lays flat to provide minimum resistance to the accumulation of snow. 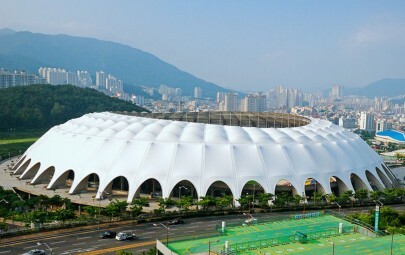 Tensile fabric structures have established a justifiable popularity among owners of concert facilities and amphitheatre venues because of their elegance and suitability for creating all weather all weather environments. The only significant disadvantage has tended to be acoustic, as a result of sound reflections bouncing off the tensioned membrane and interfering with direct amplified sources. 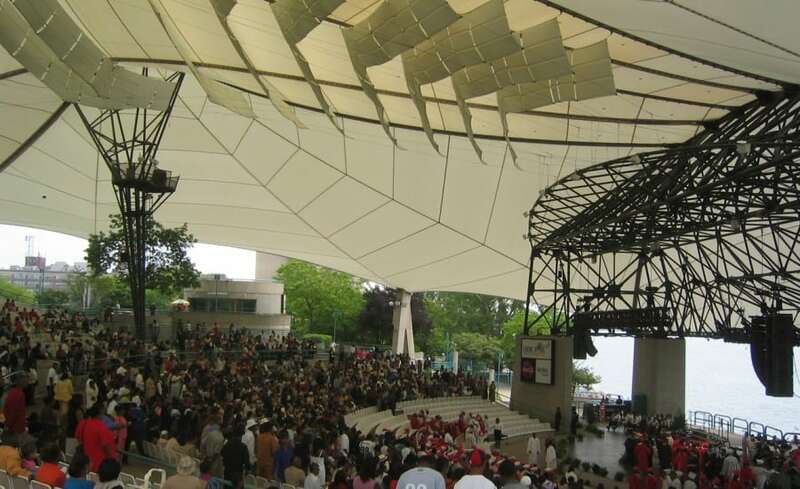 The resulting lack of clarity, particularly for speech, affected the suitability of Chene Park for graduation ceremonies and other key bookings. Following its appointment, Architen Landrells solution lay in designing acoustic baffles that could be sensitively adjusted for angle to achieve the perfect trap for reflected sound. The system needed to be very lightweight because of the loading limitations on the pre-existing structure. 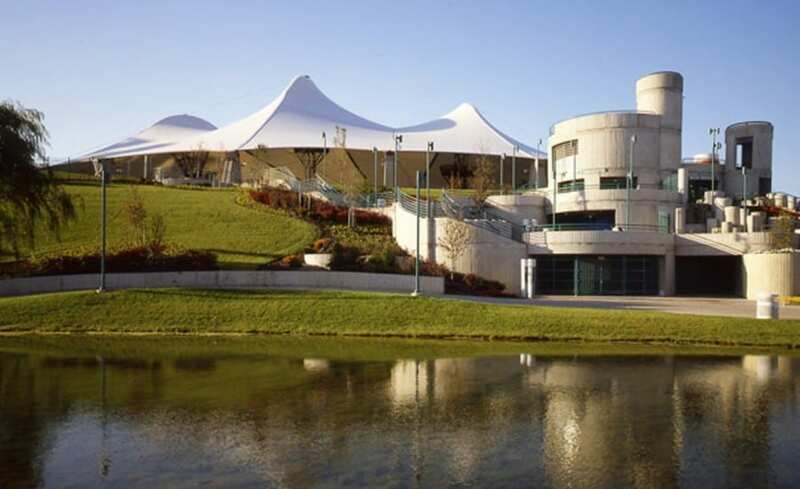 It needed to be robust and flexible to cope with the wind and dynamic roof movements and of course it needed to compliment the elegant roof that made the venue a hit in the first place. By studying all of the available acoustic materials , Architen Landrell developed a system that combined the ideal properties of lightweight acoustic foam with the acoustic transparency and structural performance of glass mesh. The distinctive wing design was inspired by the sport of paragliding a passion of one of the teams designers. The end result satisfied all of the design criteria and proved to be a visually arresting and practical structure in its own right.